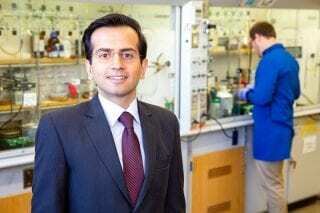 A chemist at the University of Arkansas has received a grant from the National Institutes of Health to advance development of porous nanoreactors to improve the speed and accuracy of early cancer detection through positron-emission tomography, commonly known as PET imaging. 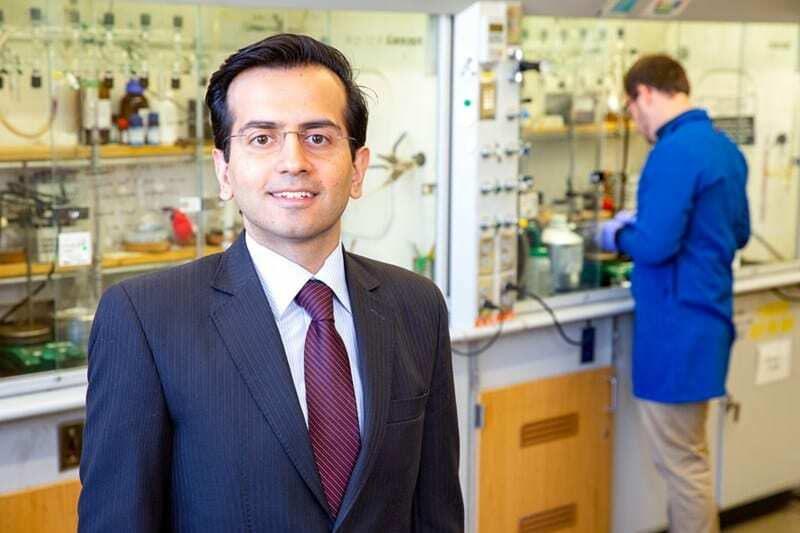 The $428,285 grant to Hassan Beyzavi, assistant professor of chemistry, supports his work to improve the effectiveness of the noninvasive biomedical imaging method. PET imaging is used in the diagnosis and treatment of cancer and other diseases. His research is focused on improving the accuracy of PET scans, through development of nanoreactors that bind radioactive isotopes to tumor cells more effectively than current methods. PET uses fluorine-18, a radioactive isotope, to detect tumor cells. The fluorine-18 must be added to specially designed molecules called tracers that are injected into the body to bind with tumor cell receptors. The PET scans pick up the radiation from the tracers that have become bound to cancer cells. New tracer molecules that selectively bind to cancer cells, but not healthy cells, have been developed; however, they currently are slow to bind with fluorine-18, and the isotope must be used quickly because of its short radioactive half-life. Tracers must be synthesized and then transported to the location of the PET scanner with enough radiation left to be effective, so the fluorination process must happen quickly. Beyzavi’s porous nanoreactor would solve these challenges. It would be comprised of thin films of a nanoporous material. The channels in the material contain catalysts, and as the fluorine-18 and tracer molecules move through the channels, the catalysts could perform the chemical reactions necessary to bind the fluoride-18 to the tracer molecules, significantly faster than the current methods. For more information, visit the Beyzavi Group online. A version of this story also appeared in the U of A’s Newswire publication. This website is the official blog of the J. William Fulbright College of Arts and Sciences at the University of Arkansas, one of the nation’s top public research institutions. We encourage thoughtful discussion about the topics we post. However, if comments or messages contain advertising/spam, are off-topic, offensive, defamatory, infringe someone’s rights, or are a violation of law we reserve the right to remove them. The university also reserves the right to refuse story submissions, and all stories submitted to the blog will be reviewed by an editor before being published. All views expressed in stories and other blog content are those of the authors and do not necessarily reflect the views, thoughts, opinions or policies of the college or university.